Once you have set all these parameters, click the "Start your day" button and the game will show you [simulate] how site visitors are clicking the ads and which ad units are receiving the most hits. If you think the earnings are too low for a particular layout, try changing the colors or adunit placements and hit the play button again. 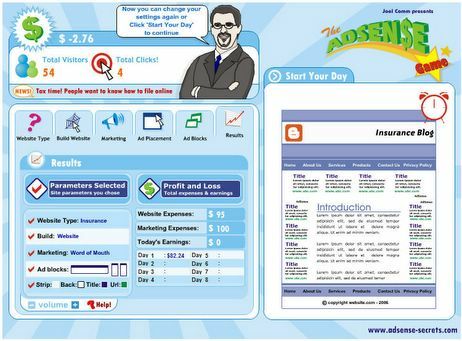 Though the Joel Comm Adsense game is just a illustration of the Adsense earnings, it is still fun and Adsense newbies may get to learn new tricks like removing borders, blending color styles, etc. Related; Try the contextual advertising tool to compare Google Adsense with Yahoo and Chitika. You can either type in the URL or any keywords.